MinION device showing its output on an iPhone. 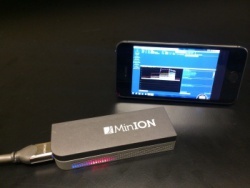 Investigators at the UC Santa Cruz Genomics Institute have optimized performance of a mobile-phone-sized MinIONTM DNA sequencer, marketed by Oxford Nanopore. Their work was reported in Nature Methods on February 16, 2015. The MinION device reads individual DNA strands base-by-base as they pass through a nanoscale pore (nanopore) under control of an applied voltage. This process is facilitated by an enzyme bound to the DNA. Biomolecular engineering graduate student Miten Jain led the research with director of comparative genomics Benedict Paten and biomolecular engineering professor Mark Akeson, who along with biochemist David Deamer has helped develop the scientific foundation of the nanopore device for the past 18 years. To optimize the MinION's performance, the researchers used standard reference genomes and an expectation-maximization algorithm to obtain robust maximum likelihood estimates for rates of read insertions, deletions, and substitution errors (4.9%, 7.8%, and 5.1% respectively). The MinION technology is constantly evolving, resulting in multiple updates to the platform in the past six months, Akeson explained. "Each of these updates has resulted in improved read quality," he said. "In this study we saw performance significantly better than what has been seen with this device before," Akeson said. "Over 99% of high-quality, two-dimensional MinION reads mapped to the reference genome at a mean identity of 85%." The UC Santa Cruz investigators also presented a tool that can be used to detect single nucleotide variants from MinION data. It employs maximum-likelihood parameter estimates and marginalization over many possible read alignments. "In this study, we were able to detect single-nucleotide variations with precision and recall of up to 99%," said Paten. By pairing a high-confidence alignment strategy with long MinION reads, the group resolved the copy number for a cancer/testis gene family (CT47) within an unresolved region of human chromosome Xq24, a feat possible only with long-read sequencing such as the MinION makes possible. "The MinION nanopore sequencer is changing how we think about DNA sequencing," Jain said. He explained that while DNA base read lengths of 8-10 kilobases are now considered normal, the MinION device has achieved reads exceeding 48 kilobases. "With the combination of long-reads and portability, the MinION is primed to disrupt the way we do genomics," Jain said. The paper's co-authors also included biomolecular engineering graduate student Ian Fiddes, postdoctoral scholar Karen Miga, and staff scientist Hugh Olsen. All are from the UC Santa Cruz Genomics Institute. The study was supported by National Human Genome Research Institute (NHGRI) grant HG006321. Read the report in Nature Methods.